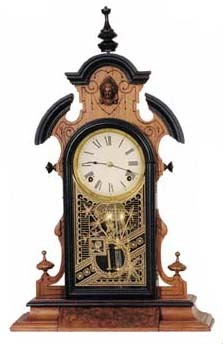 Ansonia Brass & Copper Co. parlor clock, "Japanese", ca 1874. Extra large clock at 26 inches high and 16 inches wide. The walnut case has been cleaned, has burl walnut veneer on the base, correct pendulum, dial replaced.8 day movement with Geneva stops, strikes hours on a brass bell, running great. Movement mounted with blocks.